Donated to the University Library by B. & E.A. Rosengarten in November 1909, transferred to the University Archives, circa 1960. Louis Jeremiah Cunningham Kimmell was born on 13 November 1860 in Hollidaysburg, Pennsylvania, the son of Samuel Kimmell, D.D.S., and Mary Jane Cunningham. He attended the University of Pennsylvania from 1878 to June 1883 when he received a certificate of proficiency. While he was a student Kimmell belonged to the Delta Beta Phi fraternity and participated in the reestablishment of the Delta Phi fraternity in 1882 as well as volunteered as a marshal for Athletic Association events and joining the College Boat Club. After attending the college, Kimmell entered the Medical School of the University and earned his M.D. degree in 1887. He worked as a doctor in the Philadelphia area and was a resident physician at Germantown Hospital. Louis also was a medical examiner for the Western Union Life Insurance Company of Detroit, Michigan. He died of pneumonia at his home, 340 S. 15th Street, in Philadelphia at the age of twenty-nine on 19 January 1890. Among the pall bearers at his funeral at St. Mark’s Protestant Episcopal Church were Drs. J. William White, DeForest Willard, Frank H. Getchell, and D. Webster Fox. About two years after his death a prize in his memory was established at the Medical School of the University of Pennsylvania to students who present the best thesis on a surgical subject. 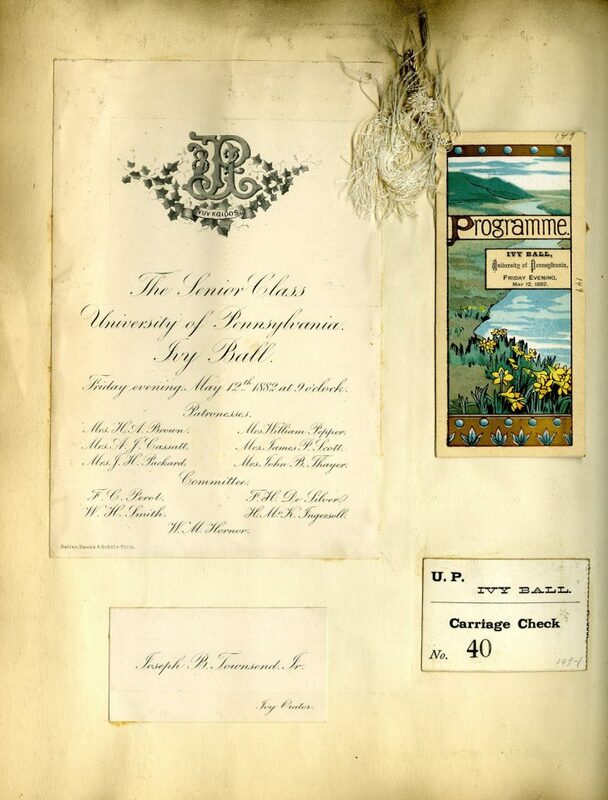 The scrapbook contains a collection of ephemera which documents Louis J.C. Kimmell’s life as a student and young adult in Philadelphia in the 1870s and 1880s. In addition to programs, tickets, newspaper articles relating to Kimmell’s college life, particularly athletic activities, there are calling cards, handwritten invitations to social events as well as wedding invitations and short social letters. There are several invitations to events sponsored by the Delta Phi fraternity. Delta Beta Phi. Sigma Chapter (University of Pennsylvania). Delta Phi. Eta Chapter (University of Pennsylvania).